Haletra has a team of specialists that can take care of the layout of all your print jobs with your input. You can also deliver the layout digitally via various channels. Find all the information you need under How to deliver. Since the files delivered must meet a number of technical conditions, they are all subjected to an entry check. For example, we check colour use, formats, letter types and images. This print-ready documentation is then put together and turned into a large montage in the format of the press chosen. 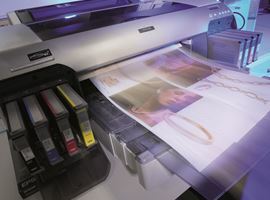 After approval of the proofs the print forms are projected onto offset plates via two fully automatic computer-to-plate installations. The guidelines for the layout vary depending on the source programme you use. To save you time we have put the correct settings into a profile that you can find here. Always lay out pages in the net final format. Book form: all pages one behind the other in ascending order. Book form: provide for a spine in the layout for thicker books. We can help you determine the thickness of the spine. Provide for a standard 3 mm bleed. Use the same names for cartridge colours in all linked programmes. Use logical names for colours according to the print colour (e.g. `Pantone 485 C’ instead of 'deep red’). Keep quadtone and pantone colours well separated. Throw away unused colours. Check the layout using separate prints. If it's not on the proofs, it won't be printed either. Avoid EPS with JPG compression and/or TIFF with LZW compression. Resolution: 350 dpi in real size for grayscale, duotone or quadtone images, 1200 dpi in real size for line art. Save illustrator or freehand files as EPS. Save Photoshop files as EPS or TIFF. Make clipping paths with paths, not with extra channels. Save as EPS. Do not embed ICC profiles in the images. Do not embed output settings in the images. Do not use strange signs (accents, slashes, etc.) in document names, only underscores (_). Give your layout files and images short, unique names. Put in your order early so that we can plan the work in properly. Do not send us the only version of your files, make backups. Thanks to Heidelberg's Prinect Remote Access you can check all your proofs online for RIP errors, overprinting, page order, bleed, etc. This online proofing system replaces the old plot proofs. This means we can make the corrections faster and short deadlines are absolutely no problem. Download the Prinect Remote Access guide (PDF). Use this to make a print-ready PDF from Indesign. See further explanations under How to deliver. This PDF guide explains step by step how to correct proofs online.